Maryland's competitive market did not develop as rapidly as envisioned when the legislation was adopted. At the beginning of 2009, ten years after the Act’s enactment, only 2.8 percent of residential customers were being served by competitive suppliers. By January 2016, however, 22.3 percent of residential customers had signed with competitive suppliers. The majority of medium to large commercial and industrial customers are currently purchasing electricity from competitive suppliers (see Table 3-3). Source: Maryland PSC, Electric Choice Enrollment Monthly Report, January 2016. Residential and small commercial customers that cannot or do not choose to transact with a competitive supplier are provided with electricity service from their local utility at rates approved by the PSC. This utility-supplied service is referred to as Standard Offer Service (SOS). Maryland investor owned utilities (IOUs) procure 25 percent of the total residential SOS load every six months under two-year, fixed-price contracts with competitive wholesale suppliers. All customers purchase electricity at prices reflecting the wholesale market, either through SOS or competitive suppliers. Wholesale market prices in Maryland rose significantly between 2005 and 2009, and as a result, residential customers saw substantial increases in their electric bills. Between 2009 and 2012, however, retail rates declined as wholesale energy prices decreased. Forward market prices have remained relatively stable since 2012. Figure 3-2 shows the average annual IOU residential rates in effect in the summer of 2005 and for each subsequent summer. 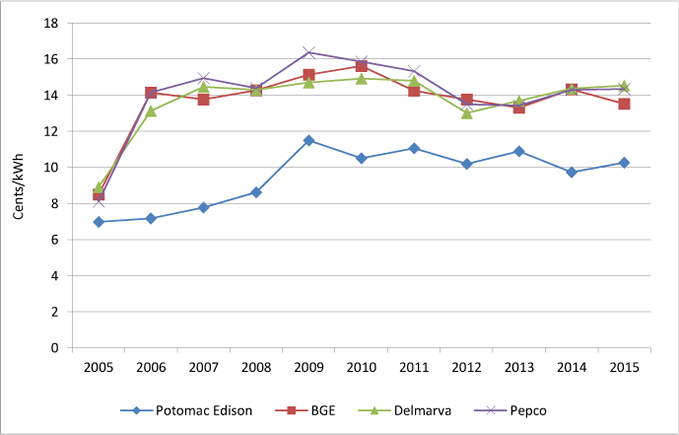 Note: Average annual rates were taken from EEI’s summer editions of the Typical Bills and Average Rates Reports, except for BGE’s 2012 rate and Potomac Edison’s 2013 and 2015 rates, which were unavailable. EEI’s summer editions take the average of the rates from the 12 months ending June 30 of the edition year.